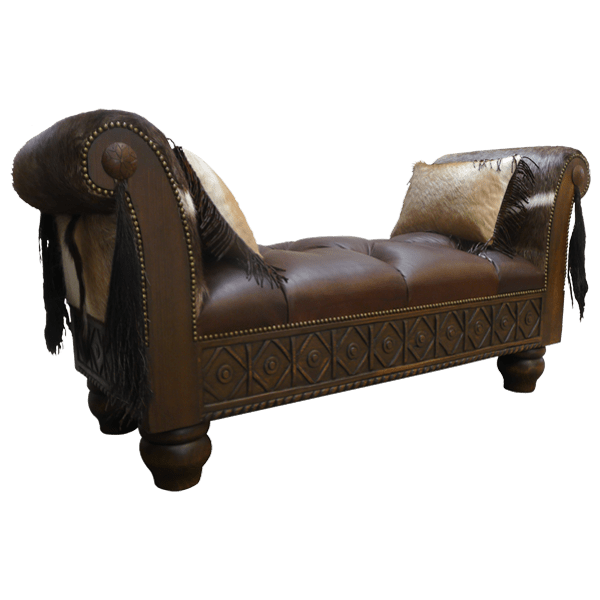 With its remarkable Western details, this handcrafted, Western style bench is essential to your Western décor. The lateral sides of the bench are adorned with tall, curved armrests. The inside of the armrest is upholstered with rich, brown, full grain leather, and the outside of the armrest is upholstered with patterned cowhide. 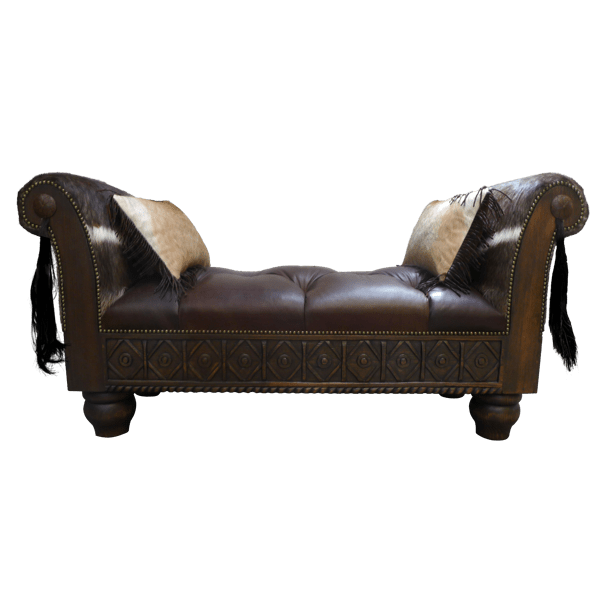 The leather and cowhide are hand tacked to the wood frame with beautiful, gilt nails, and they are also double stitched together for extra strength and durability. The front and back of each armrest is adorned with a horsehair braid. The seat is well padded and it is upholstered with rich, brown, full grain leather with a gorgeous, button tuft design. The leather upholstery is also hand tacked to the wood frame with lovely, gilt nails. The seat rest on a solid wood base, and the front of the base is embellished with marvelous, hand carved, geometric designs. The lower part of the base is adorned with an ornate, hand carved, twist rope design. The bench is supported by robust, hand turned feet. It has a classic finish, and it is made with the best, sustainable, solid wood available. The bench is 100% customizable.